By some accounts, the Elk Grove City Council could decide as early as their August 26 meeting to proceed with plans for the proposed 100-acre Grant Line Road soccer facility. Should the city councilmen decide to proceed, one of the main questions it will need to address at that meeting, or in the very near future, is how to finance construction of the facility and on-going operations. While city officials were vague when asked about financing at Saturday's soccer workshop, it has long been suggested traditional revenue bonds could be issued. From the perspective of the city council, this would be an easier and quicker route because unlike the issuance of general obligation bonds or a sales tax increase, revenue bonds under most circumstances do not require voter approval. Revenue bonds are issued based on the revenue streams from the projects which are being financed. In the case of the soccer facility, fees generated by youth soccer leagues, tournaments, and other fees, such as possible naming rights royalties, would be used to pay down the debt. Revenue bonds have several less appealing characteristics compared to general obligation bonds though. According to Morningstar, revenue bonds offers high returns for investors, and corresponding higher costs for issuers "due to the fact that the income from the projects they fund cannot be predicted with any certainly. This adds to the perception of lower safety." More risks for investors means higher costs for issuers. 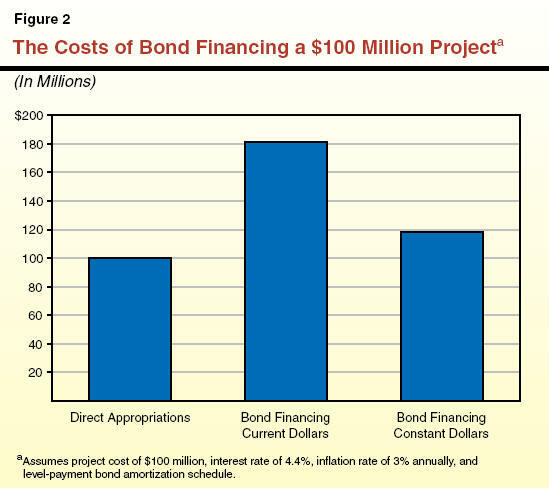 Information provided by the nonpartisan California Legislative Analyst's Office offers a discussion of bond basics and costs. The information posted below in blue is from their website. It makes sense to pay the extra cost of using bonds when this expense is outweighed by the benefits of having projects in place sooner than otherwise would be possible. This criterion is often met in the case of capital outlays, given the large costs of infrastructure projects, the many years over which they provide services, and the substantial increases in taxes or other charges that would be needed to pay for them up front. Whatever it takes to be re-elected. 1. We have several projects in the hopper that would require major outside financing. Which is a priority since we can't finance all of them. Or maybe I should say "shouldn't." 2. Will they pay for themselves? What if revenues fall short, do we have a backup plan? Some know that sports facilities are a hugh gamble and rarely pay for themselves. By the time they're paid for they are usually obsolete, but that's another story. If something paid for itself, a private business would probably do it. 3. A Sports Facility, Olympic Aquatics Center, etc. needs high level management with the expertise to keep it afloat. 4. How will these facilities fare with bigger and better facilities withn 20+ miles of EG? 5. Is it in our best interest to go BIG or maybe better to build our youth some sports fields and an "Aquatic Center" and leave the Olympics & MLS/Entertainment Center to someone else to build. Anxious to hear what some of our local experts have to say....and we have many! Stockton, San Bernardino, Vallejo for starters are good examples of fiscal mismanagement. True Anon. 12:42. However, our City Council thinks they are much better managers than anyone else and they have a problem thinking outside the box. It's all about "BIG" is better and taxpayer dollars are sooo easy to spend. Plus we taxpayers don't hold their feet to the fire when they're making these risky decisions. I'm very concerned about the assumptions made that will be included in the math of this adding up. Will they include increased sales at the mall? More hotel nights? High end tournaments that never materialize? The city often times has fuzzy math. Remember those state workers for Prison Health Care buying cars during lunch? Or the Ice Rink breaking even. We start doing all these projects at the same time and if they don't pencil out then we're in trouble. I continue to say it....now some are not laughing; Corrupt as Bell, Bankrupt as Vallejo. Been saying it for awhile now....since of course you guessed it; Vallejo went bankrupt. Think Stockton; votes increased their taxes so they could have police....had to pay for the decisions of leaders. Will Elk Grove residents now and into the future be doing the same? With the funding of the aquatics center and the Council's promise of a public private partnership which fell through when P3 International defaulted on the contract after they failed to secure the financing, it appears that bonds will be the only way to finance the youth sports complex. But which kind? If the Elk Grove City Council is, as they say are, “sound fiscal stewards” of the people’s money, they will put it up to the vote of the people for “us” to decide on municipal bonds to finance the youth sports complex – municipal bonds at much lesser interest rates and risk. And if we go bust, then all of us are in the same boat. In my opinion, the only reason the Council would opt for revenue bonds is because they honestly believe the voters won’t vote for the municipal bonds. I also believe after the operating costs are paid from any revenue generated from the sports complex, there might be enough to pay the interest payments, but not the principle payments. Therefore, the only option would be to make principle payments out of the general fund which is mainly fueled by sales tax revenue, which pays for our city services, such as our police department, waste management, and other administrative costs to run the city, including staff. EGPD is growing and contract renewals are coming up. And if, in the future, revenue bonds are ultimately what the Council does, and they put our city in financial peril, then those Council members who voted for revenue bonds will be in the bankruptcy boat all by themselves, and they, and they alone, will be responsible. Or . . . we could tax the 1%! All these proposed city projects are starting to look very similar to a Ponzi scene. Sell this project to the public with promises of a world class facility for our kids, promise that it will pay for itself with hoards of out-of-towners coming here to stay weekends, spending their hard-earned monies here on food, shopping, shelter, and amusement here in EG; finance it through bonds, and then build out the next dream plan, the acquatics center, base the potential revenues on the new mall, the new hotels, the new ampitheater and stadium. -All EXTREMELY SPECULATIVE with no assurances of results. If the first domino fails to meet expectations, the rest of the dominoes fall with it and we find ourselves unable to cover our debts and we are forced to declare bankruptcy. Slow down. Plan and fund one project at a time. Seems no one on Laguna Palms has heard of proper fiscal planning. FISCAL PLANNING? Out leaders haven't a clue what that is even about, it's all about them and the "Bells & Whistles"...not the kids! They get caught up in themselves and how they sound to the media, that don't have a nickle in the plan. We have been to many sports facilities over the years for games and tournaments and not once have we ever seen the need for a complex such as this. This is not the NFL, MLB or MLS...it's kids! All of us taxpayers have to leave town for our entertainment, might be better to spend it in that arena if you have to spend! Ever heard of RESERVES for rainy day spending...just ask us hard working stiffs about that one and we'll educate you.